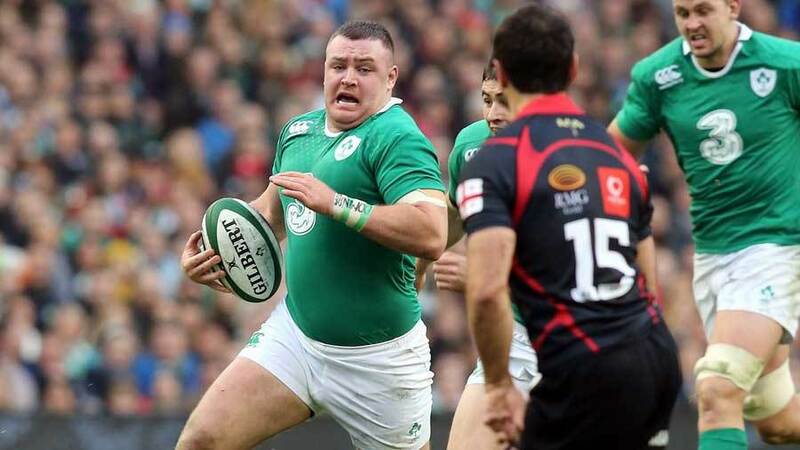 An impressive second-half showing from Ireland saw them beat Georgia 49-7 at the Aviva Stadium on Sunday. The triumph was marred by an unpunished stamp to debutant Dominic Ryan's face. The hosts were left incensed by flanker Viktor Kolelishvili bringing his boot down on back-rower Ryan's face, but captain Eoin Reddan's complaints went unheeded by referee JP Doyle. Ryan somehow escaped serious injury in a scrappy first-half, before Felix Jones claimed a brace and Dave Kilcoyne, Richardt Strauss, Simon Zebo and Stuart Olding all crossed, with Giorgi Nemsadze responding for Georgia. Leinster scrum-half Reddan was waved away despite telling referee Doyle "I have a very serious question" after Ryan received the boot to the face. Doyle responded by claiming "I can't listen to that," effectively rejecting Reddan's request for a Television Match Official (TMO) review. Referee Wayne Barnes called for a review following a request from South Africa captain Jean de Villiers that led to the Springboks' decisive penalty in 27-25 victory over the All Blacks last month. Here though, Doyle was unmoved, but Kolelishvili can expect to be cited for his reckless, if unintentional act. Ireland will learn little from their routine victory in truth, with boss Joe Schmidt having made 13 changes from the side that saw off South Africa 29-15 a week earlier. Schmidt's men host Australia next weekend, with a raft of senior stars all expected to return. The hosts wasted a number of clear-cut chances in a tryless first-half, with Georgia dominating early set-piece exchanges. Full-back Merab Kvirikashvili dragged an early shot at goal wide for the visitors, before Ian Madigan posted three penalties amid Ireland wasting plenty of territory and possession. Schmidt's men should have scored following Kilcoyne's fine galloping break, and also when Darren Cave linked well with Reddan and Ryan. Craig Gilroy spilled Cave's wide pass to leave another chance begging, and Ireland turned around 9-0 to the good with Georgia scrum-half Giorgi Begadze in the sin-bin for killing the ball. Ireland quickly broke their try duck after the restart, Kilcoyne driving home for his first Test score. Schmidt's side racked up three more wasted chances to add to first-half frustrations, before Strauss capped a regulation driving maul to double the try count. The usual raft of replacements brought Rodney Ah You into the fray, with Mike Ross withdrawn as Ireland eyed next week's Australia clash. Connacht's Ah You threw a forward pass then conceded a quick penalty in an inauspicious arrival, allowing Georgia a foothold. Then from a penalty lineout lock Nemsadze ghosted through flimsy defence to claim a try for the visitors. Just when Ireland were expecting to burst the floodgates, they found themselves under the cosh. Zebo ran in Ireland's third score after a scrum deep in Georgia's 22, following a yellow card for number eight Dimitri Basilaia. Lasha Malaguradze took a heavy bang to the head in the build-up to Zebo's try, receiving lengthy on-field treatment before being removed via stretcher. Jones finished a smart Ireland move next, before capping a field-length break launched by a smart turnover from debutant replacement Robin Copeland. Replacement centre Olding then glossed the scoreline still further late on as Schmidt's men completed their routine and expected victory. While Ireland negotiated this clash simply enough, Schmidt and friends know full well a challenge of an entirely different calibre awaits next weekend.